If you couldn't attend the meeting on Monday about Bruce Monroe Park, which the city plans to partially turn into mixed income housing, you can still be involved. Lee Goldstein, who works for the city's Office of the DeputyMayor for Planning and Economic Development, is the person to contact -- he's lee.goldstein(at)dc.gov. 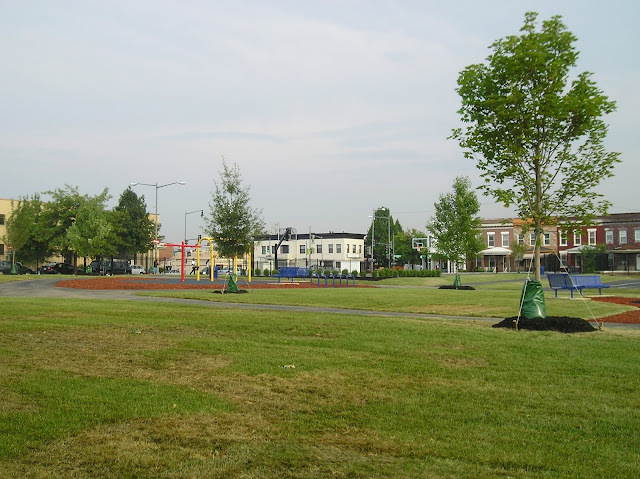 In addition, the ANC has released results of a survey of residents asking about what they would like to see at the site: most people supported a park or park mixed with another public use like a school, library or rec center. A plurality (but not majority) of people did not support commercial or residential development combined with a park, which is the current plan. The plan involves taking at least half of the park and turning it into mixed-income housing which will replace the troubled Park Morton housing nearby. Some people argue that Park Morton needs to close (it's had a lot of problems) and the residents must receive housing, and this represents a good location for it, while others say they should be housed elsewhere. Park View DC has a brief rundown of Monday's meeting. A planner said the development, which includes townhouses and buildings, would be 20% market rate and the rest a mix of public and affordable housing, which would come at least partially from Park Morton. Some people at the meeting suggested that the park shouldn't be "surplussed" -- a legal thing where the city says land has no public use, so they can use it for something else. They argue that it's clearly a popular park so it's not surplus, while others suggested the big old Hebrew Home site on Park Road as a better location for the residents from Park Morton. Others supported the city's plan, arguing that it's a good site and the park was temporary anyway. That seems to match up with a survey released a few weeks ago about the site: There was a roughly even support or oppose split for having the site partially park and partially commercial or residential -- 47% disliked that while 43% liked it. About 84% of people liked using the whole site for a park (what it is now) and 64% of people opposed using the entire site for commercial or residential development. About 70% of people supported a park mixed with public use like a school, library or rec center. Also, the survey didn't specifically mention the idea of moving the Park Morton residents to the site, even though that was in the planning phase, which may have led more residents to oppose non-park or public development. Interestingly, the plurality of people (25%) who responded said they didn't use the park. The full survey report is here, which also includes quotes from respondents. It's pretty interesting. Park View DC (which is run by ANC chair Kent Boese) also notes that the survey respondents might or might not match the opinions of the neighborhood as a whole. The respondents were 75% white, 9% Hispanic, and 17% African American while they aimed for a roughly opposite survey, which is based on the 2010 Census: 21% white and 63% African American. It's a tricky question -- the Park Morton building has major problems and residents need something else, the city is required to provide housing for every unit that is demolished from Park Morton, and this land is available. However, there may be other options, and many people love that park.